size that would better meet your needs. 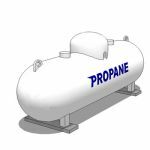 DO I HAVE TO BUY MY OWN PROPANE TANK?! reasonable and varies based on the size of the tank.